Turn your R code into packages that others can easily download and use. 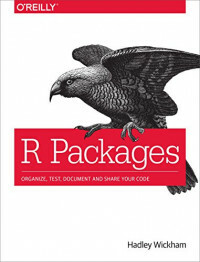 This practical book shows you how to bundle reusable R functions, sample data, and documentation together by applying author Hadley Wickham’s package development philosophy. In the process, you’ll work with devtools, roxygen, and testthat, a set of R packages that automate common development tasks. Devtools encapsulates best practices that Hadley has learned from years of working with this programming language. Ideal for developers, data scientists, and programmers with various backgrounds, this book starts you with the basics and shows you how to improve your package writing over time. You’ll learn to focus on what you want your package to do, rather than think about package structure.